9.1.16 : Not only did I get to be on High Maintenance, I got to wear a flower crown. I mean... What more could you ask for in your HBO debut? Thrilled to be a part of this awesome show's initial run and so excited for the six brand new episodes coming to HBO on 9/16. I've never used this phrase aloud but "It's lit". In other news : We just had a wonderful sold out Mother Line Story Project evening at the PIT... Can we take a second to say amen to women making things together? And I just finished the inaugural run of the Armory, the Tank's improv house teams. My favorite role I played was probably a teenage girl who loved drinking wine coolers with her Mom. You know. More to come... ! Leemore on Episode 12 of High Maintenance, "Matilda"
11.20.14: #serials is on Time Out New York's list of What to do on Saturday: 50 Great Ideas! Come join us, Thursday through Saturday at 11! Pick a date here. Our show ROMANTICS ANONYMOUS by Matt Barbot is about to have its third episode and we couldn't be happier! Plus: Performing this Sunday at my alma matter, Atlantic, as part of their alumni series in the McDonalds Plays... That's my kind of week! 9.11.14: I am so proud and excited to be a part of #serials, our late night episodic play competition at the Flea. In my first two weeks, I have played the monitor of a blood sucking computer, and a cross dressing heiress of the 1940s, in plays by Mariah McCarthy and Damon Chua. We slap the five plays that make up the evening together in TWO days, from the first read of the script to the most creative costumes in town to a 30 minute tech... After which we open a couple hours later. It's awesome. Backstage agrees in this week's issue! We're back for more in October, so watch this space! 4.22.14: What a raucous celebration we had opening our not so little show that could, The Mysteries, at the Flea Theater this past weekend! We are a New York Time’s Critics Pick, our second time in the paper this month, after a feature a few weeks back! We have a team of close to 150 collaborators on this piece and it is a huge thrill to have our work be seen at last. Come on down! Tickets and information are here. 50 plays by 50 playwrights, 54 actors, a choir of angels and dinner and dessert. What more could you ask for!? Also! Learn more about us on Michael Bradley Block’s awesome website Theater in the Now, where he posts the gospel according to our cast daily. Here's mine to start! 3.16.14: Today we are almost one month away from opening the massive and magnificent The Mysteries at the Flea Theater. I can barely believe it as I'm writing it: This is an evening of FIFTY world premieres written by playwrights that are both illustrious and emerging. We are a company of 54 actors, radically retelling the stories of the Bible. You'll laugh, you'll cry, you'll eat! A delectable dinner is served mid show. I am moved daily by the work of my fellow actors and actresses and have broken into laughter in the midst of a scene more times than is professional to admit. Please join us for what is going to be a one of a kind experience. Click on the apple for all the information you need! 2.4.14: Happy day, y'all! 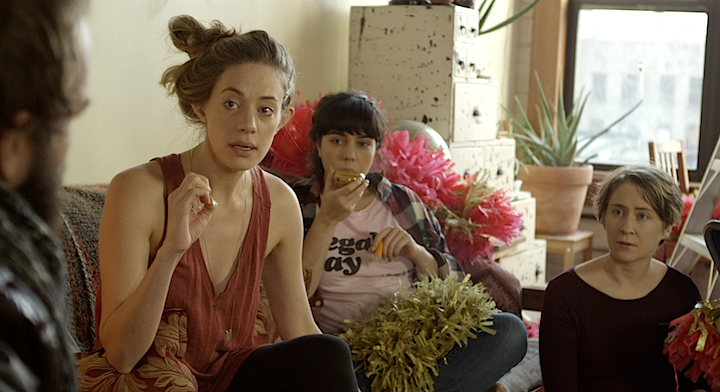 The episode of High Maintenance I'm featured in, "Matilda" is out today!!! I had so much fun working with the delightful Katja Blichfeld, Ben Sinclair & Russell Gregory on their baby. What a crew. Watch & learn! And once you're hooked, go here for more episodes... You're welcome. 12.28.13: I am a very happy lady tonight. As of this evening, I am a member of THE BATS, the Flea Theater's resident company AND!!! I will be performing in The Mysteries, Ed Iskandar's 50 play (and 50 playwright!!!) cycle there this spring. I could not be more thrilled. I was privileged to take part in a workshop of the piece earlier this month and the ensemble is full of intensity and hilarity. To have a theatrical home is a huge gift for any actor, and it's only been a few hours... I have not yet grasped that I am IN a company. What wonderful news to start off 2014. A very happy new year to you all & stay tuned for more shortly!!! with Kimberly Graham of Judy Henderson & Melissa Moss of Bowling/Miscia. And here's a still from my shoot with Zack DeZon, a gentleman & photographer working on an exciting book calledThe Field, featuring of portraits of actors and coming out later this year. 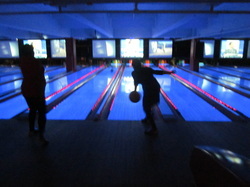 Bowling last month. I lost. It's fine. 3.7.13: Big news, folks: My video page is "a thing", to quote Liz Lemon! I'm really excited about it and there will be more on there shortly. 2013 has been full of meetings and readings with fantastic industry folk! While the audition circuit has been dry (although it looks like it's starting to pipe up again! ), I've still had some amazing opportunities. I've recently been a reader for Alaine Alldaffer & Lisa Donadio at the Women's Project, Heidi Griffiths & David Vaccari, among others, and I've been working on my on camera technique with Erica Jensen, Paul Davis & Emer O'Callaghan. Keep your eye out for more clips soon! 6.18.12: I don't know how else to start this other than by saying I'm blessed. Since I last wrote, I have been called in by Alaine Alldaffer to audition for Sam Hunter's The Whale at Playwrights Horizons and by Ann Goulder for Casse tête chinois, the third film of Cedric Klapisch's L'auberge espagnole series. I've been Jessica Daniels' of 30 Rock''s reader and I've worked on Boardwalk Empire... Alongside a firebreather. Not to mention upcoming projects with my lovely friends Carolina Mesarina, Ashley Kelly-Tata, Andrew Belcher & Jonathan Camuzeaux. I am so grateful for this momentum and these opportunities. My greatest aim is to keep them going and growing. Love & thanks. 5.4.12: The end of Spoon River Anthology left me with "the mean reds", as Holly Golightly would say... How can you help being sad when you've been surrounded by 99 (!!!) inspiring actors and an incredible crew, all doing what you love together & the last show comes around? Luckily I had Boardwalk Empire to distract me just two days later... This Monday was HUGE because it was my first shoot on the actual boardwalk! The scene takes place on a bustling January afternoon so we really got to work all day... It is such a privilege to be on this set, the crew are such sweethearts & they are very generous with me... By that I mean you will hopefully be seeing me in Season Three! The magnificent Kelly McDonald & I may or may not have had a moment... But I don't want to jinx anything so let's hang tight. And today, I got a phone call from my friend & collaborator Ashley Kelly-Tata, inviting me to perform in a play she is directing for Clubbed Thumb's upcoming festival at Here Arts Center on May 22nd! Feeling blessed. Love & thanks! I can't believe we are finally opening tonight, at Riverside Church in Harlem: 100 actors in Spoon River Anthology . We are fortunate enough to get to watch the show every night along with the audience and it is such a gift. It is impossible to have an ego in this process, with inspiration coming at you relentlessly from the talented folks onstage and the incredibly focused and professional crew behind the scenes. I feel so blessed to be a part of this, and so excited to be performing for the next two weeks! Please join us, all the details are at the link above... And I should have more photos soon. That's one of my fellow cast members, Molly McAdoo to the right, I love that picture, I think it should be our postcard! It perfectly captures the magic of this show. See you there!